Question: Is there an automatic way to obtain my case number and court assignment without having to go insane first? Answer: eFileTexas is bad about not providing that info on the file stamp or on the notification of acceptance email you receive from them. FileTime sends you an Accepted Submission Notification email (Figure 1) after eFileTexas alerts us that the submission has been accepted by the clerk. This email contains both your court assignment and cause number. After logging into FileTime, and while in the Workspace (Figure 2, B), click the Submissions button (Figure 2, B) on the sub-menu. You are now on the Submissions page. Find and click the submission for which you wish to see the case number and court assignment. It will then be highlighted. 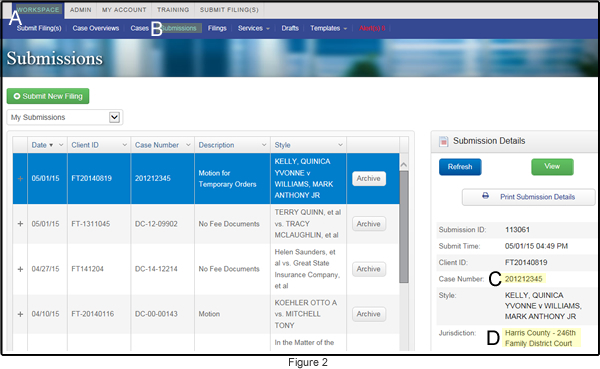 You can see the case number and court assignment in the Submission Details area. After logging into FileTime, and while in the Workspace (Figure 3, B), click the Filings button (Figure 3, B) on the sub-menu. You are now on the Filings page. 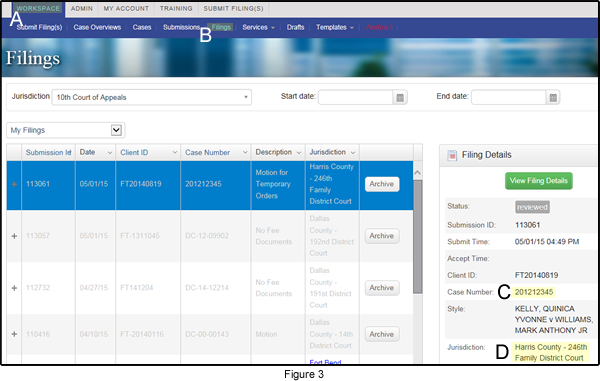 Find and click the filings for which you wish to see the case number and court assignment. It will then be highlighted. 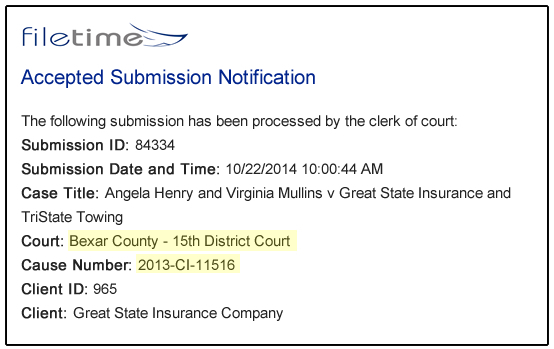 You can see the case number and court assignment in the Filing Details area.